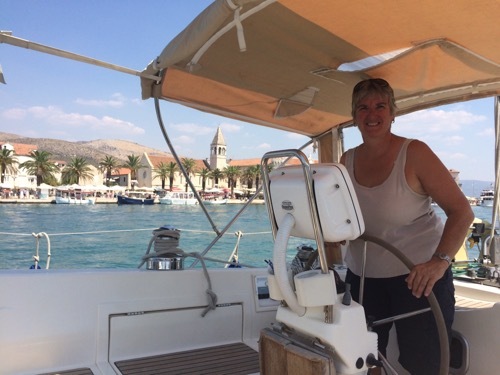 After leaving Trogir on Thursday morning, we realised what people meant when they said that Croatia is very busy in August. First we made our way over to the Blue Lagoon but it was both very windy and also busy so after a quick fly by, we decided to move onto the island of Solta. Every anchorage we went into was full as it was after 3pm. 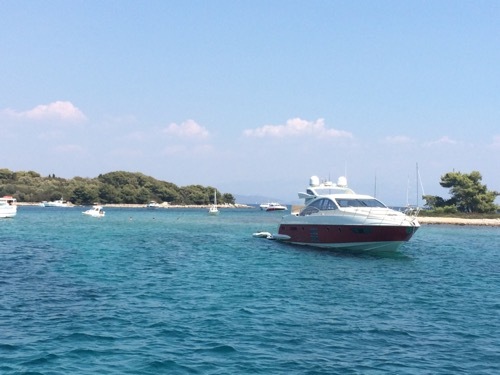 It seems that people leave their previous night’s mooring by 10am and get to the next one by 3pm in high season. 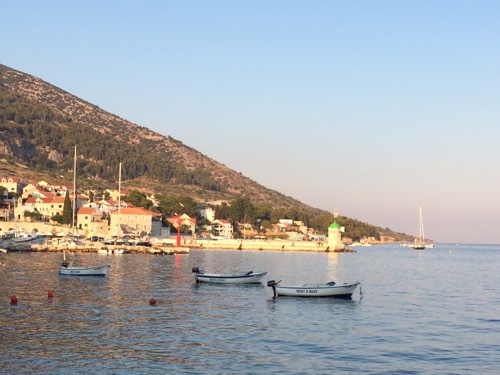 We finally found one at the eastern end of Solta but decided that we might as well go onto Brač as we wanted to get to the beach at Zlatni Rat in good time the next morning. 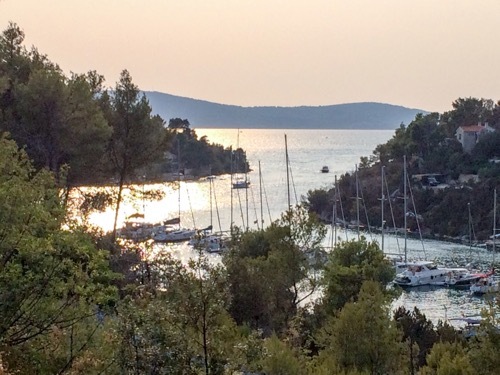 We found a lovely anchorage in Lucice on the southern side of Brač. One of the arms of this cove was filled with mooring buoys that had been reserved and were associated with the restaurants there so we went into another section. We anchored and took lines ashore, which always takes much longer than you think, especially when there are only two of you! However, all went well and we had a really peaceful night. We left early to make our way towards Bol as we had assumed that the mooring buoys there would be a scarce commodity but were surprised to find that there were several free. I think it had something to do with the fact that it was a Friday and all the charter boats were heading back to base. 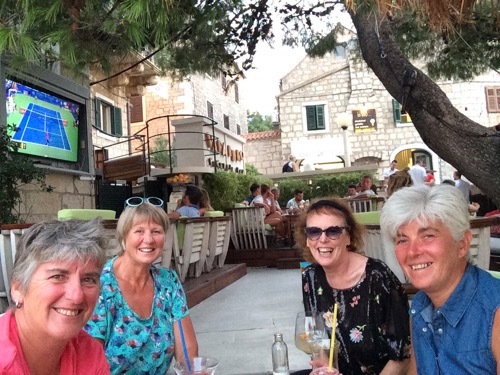 We dinghied over to the famous Zlatni Rat beach to meet up with our friends, Sue and Sheila, who were staying in Bol. 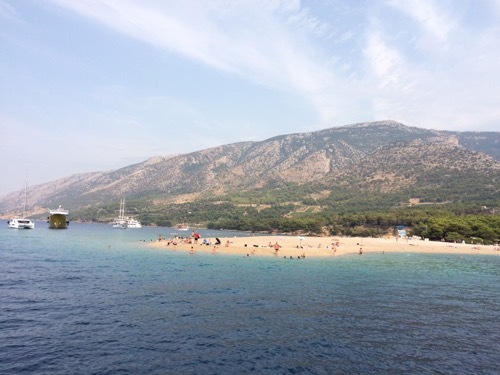 Zlatni Rat is great for people watching as it is like a magnet for tourists and locals alike. Every nationality, shape, size and shade of pink were there! 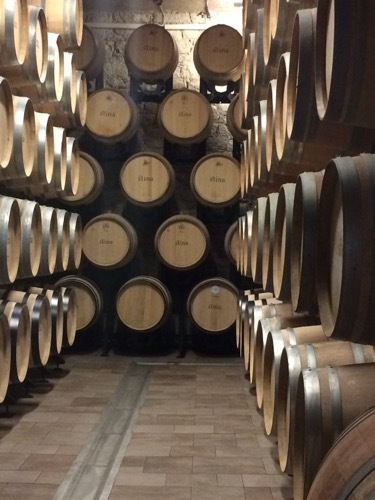 We spent a lovely couple of days with Sue and Sheila, sampling the local restaurants and also the local wine – all very civilised except that the bars don’t shut until 3am and neither does the loud music. Goodness only knows what it would have been like if we’d moored up to the town quay. Sunday we decided to move on and seek a sheltered cove as another Bora (strong NE wind) was due that night. 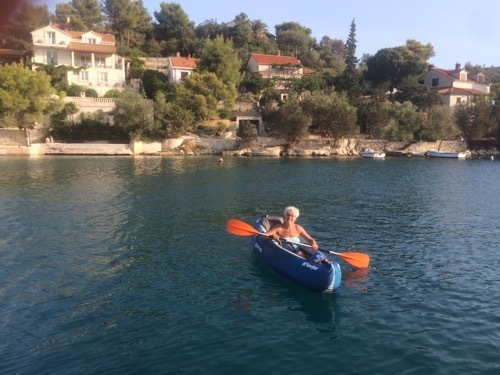 We found a lovely cove at Bobovišca that has mooring buoys and stern lazy lines so you are very secure and they can get more boats in. The village has a couple of restaurants and the same number of shops but perfect for what we need. Being tucked in we only saw gusts of 25 knots or so rather than the predicted 35 so we had a very good night’s sleep in the cool breeze. We’ve stayed another day here as the wind was still strong the morning and we took the opportunity to give Nimmie a good bottom scrap – boy did she need it! Bobovišca with Liz coming back from the shops! 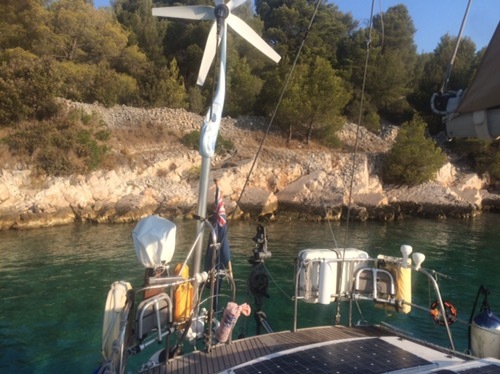 This entry was posted in News and tagged 2017, Adriatic, Croatia, Maintenance, Med. Bookmark the permalink.